Six nights before WWE Money-in-the-Bank, the 1307th edition of WWE Monday Night RAW came to you, live, from the Verizon Arena in North Little Rock, AR. Before they join the Superstars of SmackDown LIVE this Sunday night in the Men’s Money-in-the-Bank Ladder Match and the Women’s Money-in-the-Bank Ladder Match, respectively, the Superstars of RAW who have qualified for these two Money-in-the-Bank Ladder Matches would compete in two Fatal 4-Way Matches on RAW. On the men’s side of things, Finn Balor, Kevin Owens, Bobby Roode, and Braun Strowman would compete in their Fatal 4-Way Match while the women’s side would see Ember Moon, Alexa Bliss, Natalya, and Sasha Banks square off in their Fatal 4-Way Match. Plus, before Nia Jax defends the RAW Women’s Title against Ronda Rousey this Sunday in Chicago, Nia and Ronda would have one last face-to-face confrontation before their title match at Money-in-the-Bank. Fatal 4-Way Match: Natalya def. Ember Moon, Alexa Bliss, and Sasha Banks by Alexa Bliss submitting to Natalya’s Sharpshooter. Dolph Ziggler & Drew McIntyre def. Breezango by Dolph Ziggler pinning Fandango following the Zig Zag/Claymore Kick. Roman Reigns def. Sunil Singh (with Jinder Mahal) by pin following the Spear. The B-Team def. Heath Slater & Rhyno by Curtis Axel pinning Heath Slater following the double team neckbreaker. Ruby Riott (with Liv Morgan & Sarah Logan) def. Bayley by pin following the Riott Kick. No Way Jose def. Curt Hawkins by pin following the pop-up right hand. 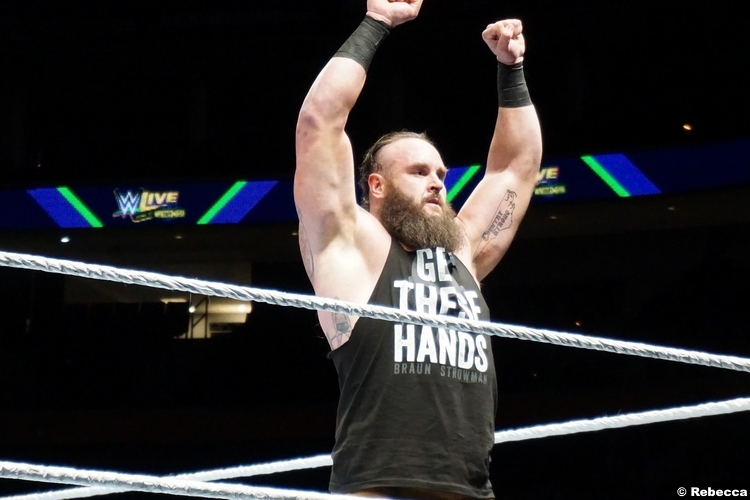 Fatal 4-Way Match: Braun Strowman def. Finn Balor, Kevin Owens, and Bobby Roode by pinning Kevin Owens following the running powerslam on a ladder.